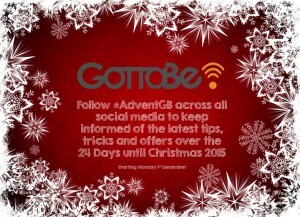 Following the popularity of last year’s Advent Marketing Tips, help GottaBe! count down the days to Christmas with our Christmas advent calendar and enjoy 24 days of virtual chocolate through the wonderful world of social media. To speed up the hours and distract your minds from the turkey and presents, we will be posting a mixture of 24 facts, offers, and marketing related tips, to add a little extra sparkle to your day and indulge you further into the world of marketing. From Monday 1st December, make sure you like us on Facebook and follow us on Twitter and get ready to kick off Christmas in style with GottaBe! A new virtual chocolate ‘tip’ will be revealed at 10:30am every day and you can follow the trend further through #AdventGB. GottaBe! Ethnic Welcomes A New Addition To The Team – The Digi-Van!